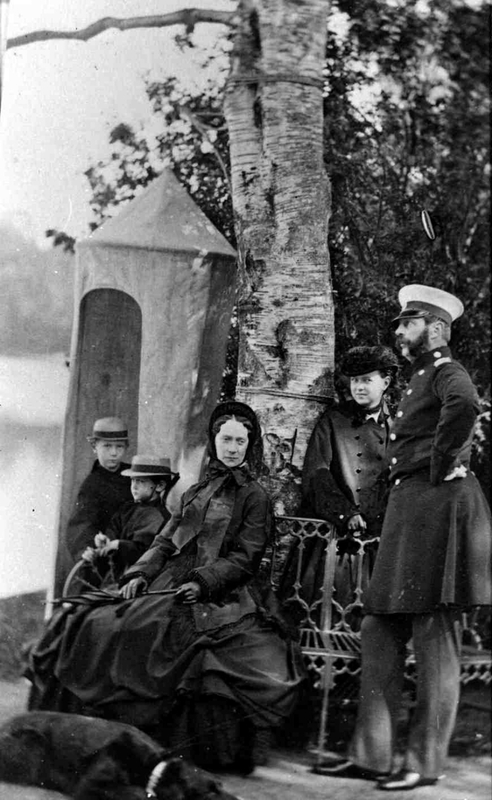 Emperor Alexander II with his wife Maria Alexandrovna and children: [Maria], Sergei and Pavel at the pond [Izomaterial]: [photo]. - [Between 1860 and 1870]. - Projection printing with a counter, black and white. - From the album: "Personal album of Alexander II (1860-1870)". - Portrait group: Alexander II in military uniform, standing by the bench, profile to the right. Empress Maria Aleksandrovna sits on a bench, with a dog at her feet. On the right are the Grand Dukes Sergey Alexandrovich and Pavel Alexandrovich (about 3 years (?)). To the left of the mother is the Grand Duchess Maria Alexandrovna (?) . 1. Alexander II (the emperor of Russia, 1818 - 1881) - Portraits. 2. Maria Alexandrovna (Empress of Russia, 1824 - 1880) - Portraits. 3. Maria Alexandrovna (Grand Duchess, 1853 - 1920) - Portraits. 4. Sergey Alexandrovich (Grand Duke, 1857 - 1905) - Portraits. 5. Pavel Alexandrovich (Grand Duke, 1860 - 1919) - Portraits. 6. Power (collection). 7. Group portrait photos.